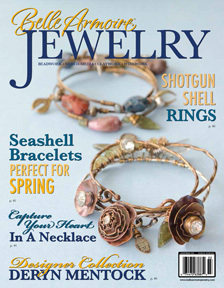 I was surprised and flattered last week to receive an invitation to be a Design Ambassador for Jesse James Beads! How it works is they send out a packet of beads, I use them in my designs and post them on Instagram and/or Facebook, and they send more beads – how fun is that!? My first packet arrived today and I couldn’t wait to get started – within an hour I made 3 pairs of earrings and a pendant, which is pretty productive for me! It’s interesting that some of these are beads I probably wouldn’t have picked myself, but using them stimulated my creativity which is a very good thing! Be sure to check out all the beautiful beads available at www.jessejamesbeads.com! So excited to have several pieces in the Winter 2018 issue of Belle Armoire Jewelry! BAJ has been my favorite jewelry magazine for years, and it’s such an honor to be included with so many talented artists – it’s a dream come true every time!